As another year comes to an end, I figured I'd mark the moment of hitting 365 posts this year. Once again. This is the sixth year that I've hit a post-a-day and the fourth year in a row. Due to a variety of circumstances, I've been fortunate to been able to keep posting here in my diary everyday and while I know there are some of you guys out there that are reading these, the point of this isn't to grow my audience but to flex my writing/creating/posting muscles and to chronicle some small moments/items/places/things in my life while filling up the funnel of my online life. 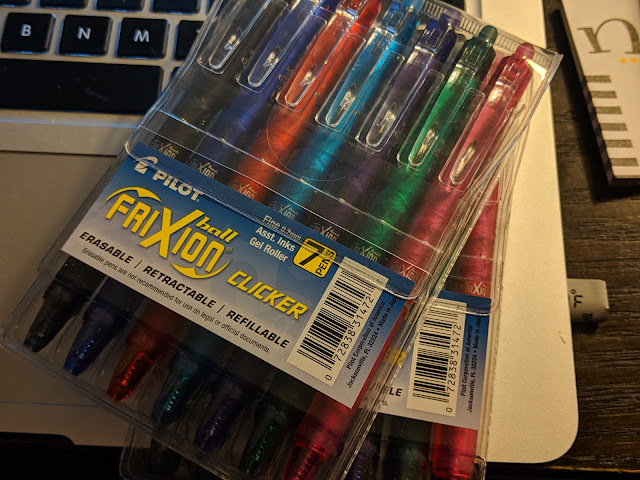 I was gifted two of these seven-packs of clicker pens for Christmas and they immediately went into my work bag to head to the Aon Center. Erasable - yes. Refillable? I guess so. But who's refilling pens? 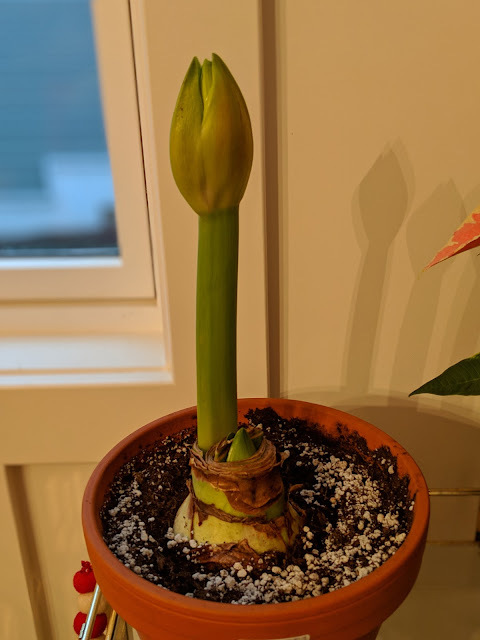 The last time we checked-in on our Christmas Amaryllis, I was hopeful that we'd see a Christmas flower. Alas, Christmas Day has come and gone and we're still staring at a bud with no flowers. But, what is most interesting is that this is a 'short' bulb. I've been - basically - poisoning the bulb with a 8% dilution of alcohol in an attempt to keep it from getting too tall. It appears to be working. But that doesn't change the fact that our bulb isn't going to flower any time soon. 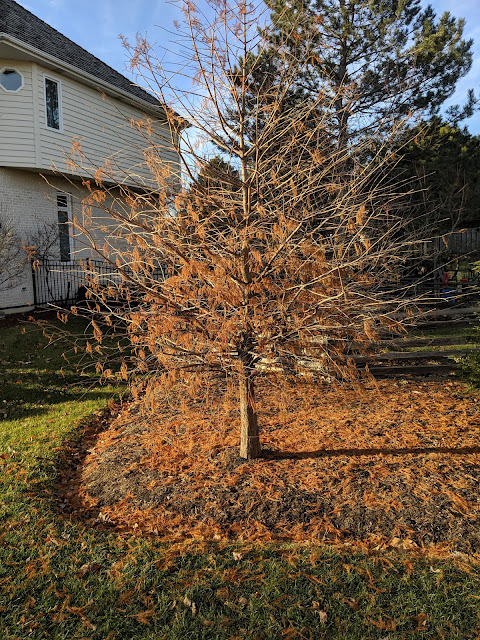 And out front I noticed that they have a medium-sized Bald Cypress planted near the sideyard that was striking in it's winter beauty. You can see it above. Plenty of the needles have dropped. And all of them have gone orange. But, plenty of them remain on the limbs. The reason for posting it here is because our little Bald Cypress - that we planted near our driveway late this Summer - looks similar. This is a car that runs on the Mantleburg line. 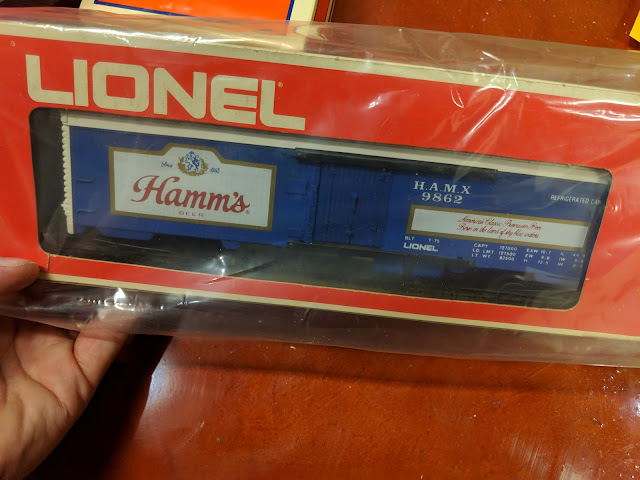 Built in 1999 by Lionel, it doesn't have a box and is very heavy. The yellow and blue look sharp on the tracks. Marking it down. Owned. And let go. 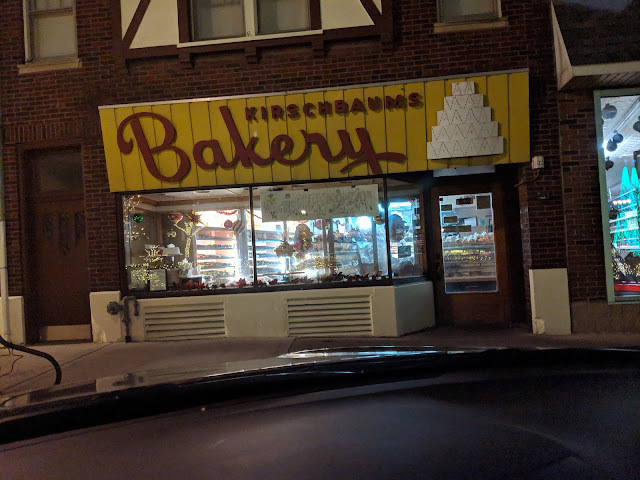 One of my annual Christmas-related traditions is getting to Kirschbaum's Bakery in Western Springs on the day (that they are open) before Christmas - usually Christmas Eve. This year, I arrived first (!!! ), but because I wanted to stay in the car as long as possible, I waited until someone else got out of their car to get in line. It always is someone who arrives like fifth who wants to get out of their car and start the line. Then we all have to get out, bundle up and wait for the 45 minutes or so to open. I ended up with #2. Not too bad. Last year, I was #6. I was in-and-out in less than ten minutes this year. Best day of the year? Yeah. Sure is. Hope you spend it with the ones you love. I know I will be. I'm grateful for my family and I'm most grateful for Nat. 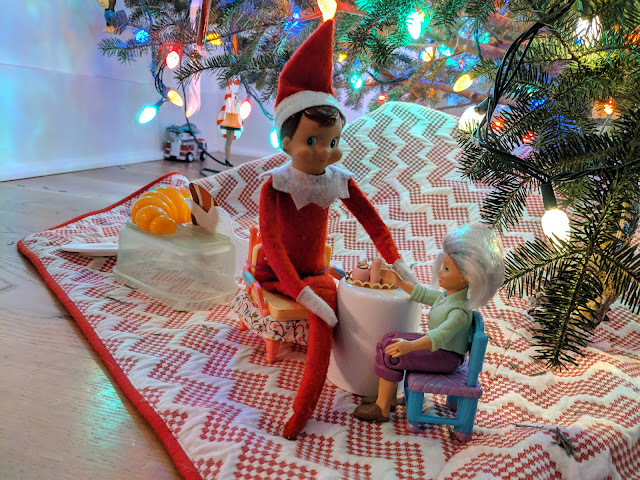 Today is the last day we get to spend with our elf Goldie. I'm grateful for his visits. 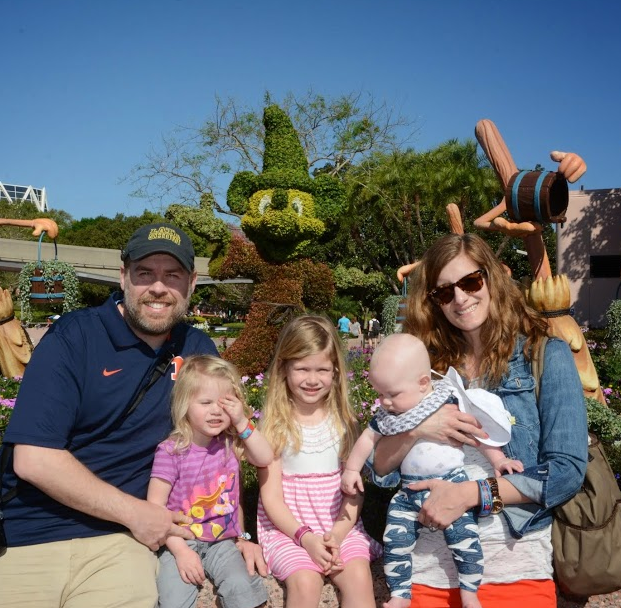 And the little bit of magic he shares with my kids. See you in 11 months, Golide. And, is there a Tree? No. Instead there's a pole. Happy Festivus to you and yours. Is this little tree going to make it? I'm posting this photo of this tiny tree to see if I can document if it is, indeed, dying before my very eyes. This is something that we had originally planted out in one of the girl's fairy garden this Summer. 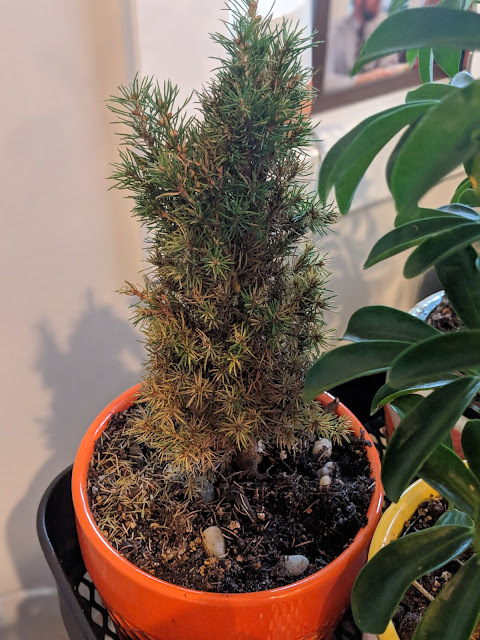 It was an expensive plant (like $12), so before the frost hit, I thought that I'd bring it inside to see if we could overwinter it. I *think* it is getty more brown everyday, but I'm unsure. So, this post will serve as a guidepost for me when I revisit this thing in January. 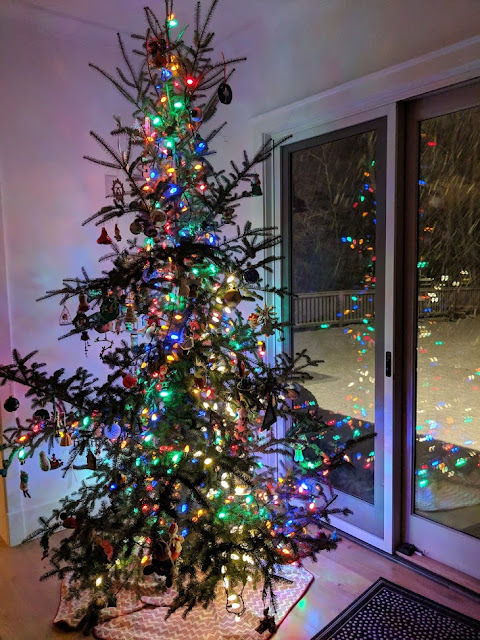 The top looks just fine, right? But look at that bottom part. Almost orange. I've done this 'will it make it?' thing with larger trees out in yard. Here's the same type of post from our first Dawn Redwood. The last time I posted in the [firewood consumption] diary was back in the very beginning on November of this year. 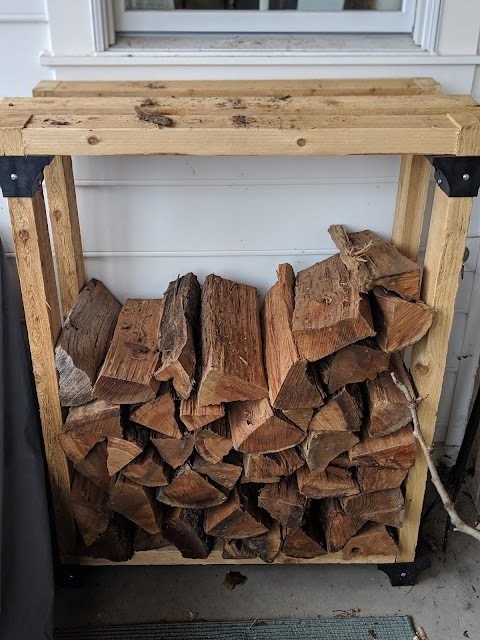 At that time (post here), I had not touched the two 'indoor' racks (indoor meaning inside the screened porch) and had worked my way through about half-way of the outdoor third rack. Today, I'm documenting where we are right ahead of Christmas. In today's post there's only two photos of the inside racks. That's because we've totally consumed the outdoor rack in its entirety. And we're working against the two indoor racks. The top photo shows where we are in the smaller rack - with about half of that wood consumed. The bottom portion remaining is Cherry. Below, the second photo shows the full 'big' rack that shows we've mostly NOT touched this rack with Cherry on top and Birch on the bottom. 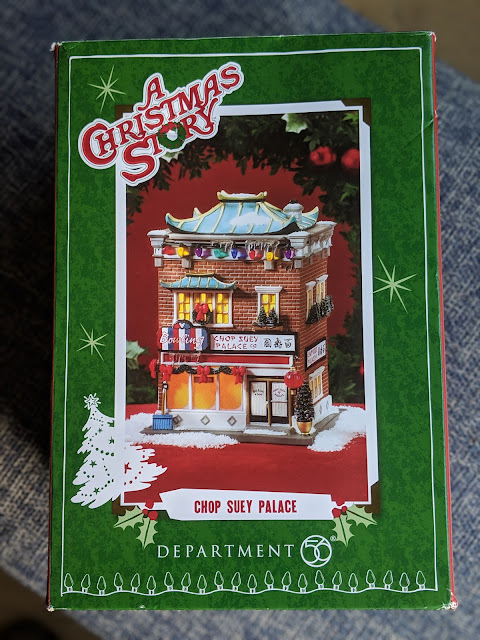 A few years back, Nat gifted me this Dept 56 building from "A Christmas Story" line that was part of Mantleburg. It was the only A Christmas Story (it is difficult to continue to insert that "A" in the name of the buildings, but I'll continue to do it.) building that we have as part of Mantleburg. And, if you have been paying attention over the past few years, you might know that things have slowed down in Mantleburg. We haven't added or annexed any new buildings into the Village of Mantleburg for the past few seasons and have seen some of Mantleburg be de-annexed (via Craigslist) and re-annexed into other neighboring communities. And that's ok. We're trying to simplify things around Christmastime and we're focusing on the Mantleburg line. In the photo above you can see both of our Rhododendrons that flank the stoop out the back door of our family. In April of last year, I showed the landscape plan that specified these two plants to be placed in the beds on either side of the rear stoop and then in June, I got around to actually planting them. And they bloomed beautifully this Summer. 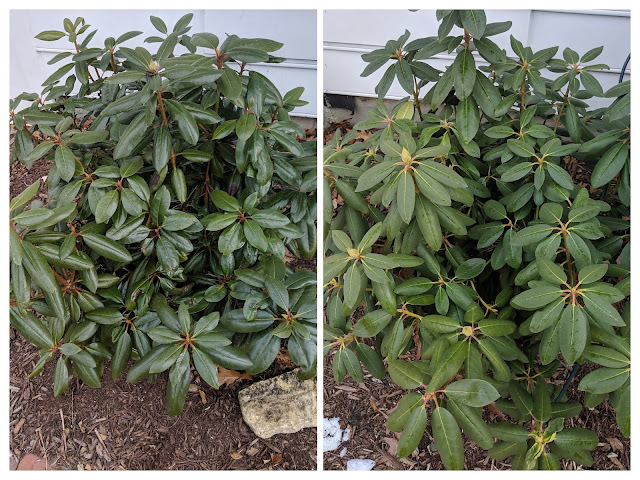 They're a really interesting plant/shrub because they have an almost tropical appearance but also are winter hardy here in Zone 5B. They keep their leaves on all winter, but that doesn't mean they can't use a little bit of help in fighting off the harsh cold and ice. One of my Christmas traditions is going to the annual Dupage County Train Show with my Dad, my nephew and my kids. I've posted about it the past few years and have done a little show-and-tell in posts of the items that we've added to the Mantleburg line. Last year, I posted photos of the Plasticville Drug Store, a Schlitz Beer Lionel Billboard, an American Flyer Lackawanna Bridge, and a 70's or 80's era Lionel Flag Pole. In 2016, we added an operating car or two. 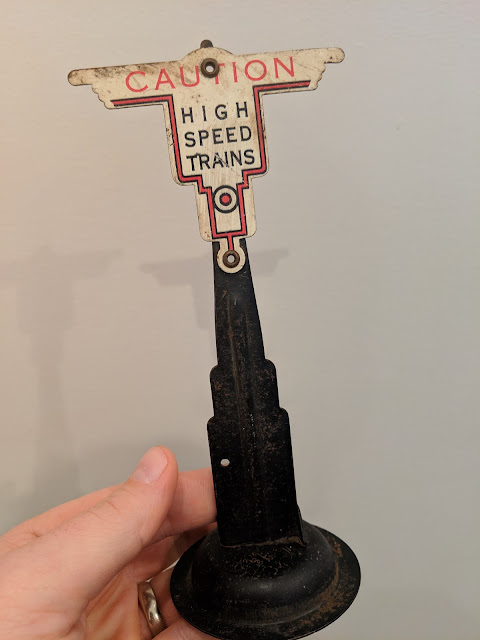 This year, I ended up buying just one thing: this Marx Tin Plate Pre-War trackside sign. It was just $2 and I liked the looks of it, so I made the deal. It doesn't operate or animate and it isn't exactly in line with the kids Mantleburg line (with our FasTrack and all), but that's just fine. I've added it to our Christmas Train layout and I think it adds a nice, vintage touch. 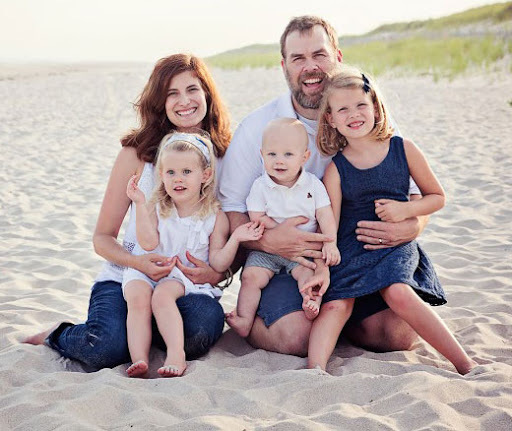 Back in September, Nat and I celebrated our 10th Wedding Anniversary. 10 years. Holy cow. I find it so hard to believe how lucky I've been. Although I failed at *some* of years in terms of delivering to her the 'traditional' anniversary gifts, I've tried to stick to the plan. For instance...nine years is pottery. So, I got her both a flower pot and a glazed tile. Ten years? The traditional anniversary gift is tin or aluminum. That one had me scratching my head. I try to buy something vintage for these gifts and all my searches turned up housewares (platters or toasters or serving utensils) and I knew those wouldn't work. 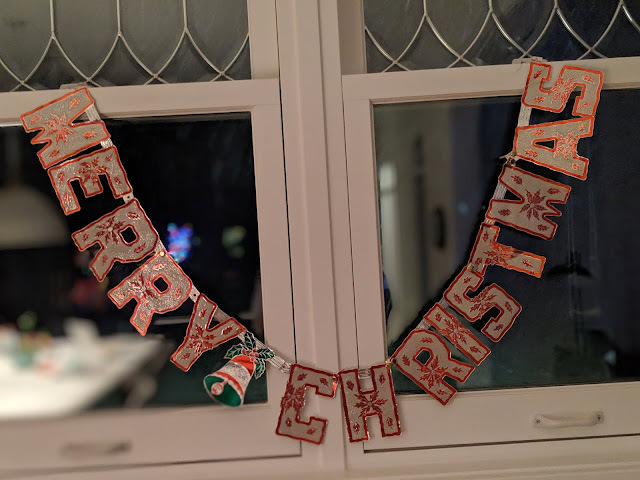 But then I found this Merry Christmas banner. It is tin. Or maybe aluminum. Not sure. But it *is* metal and super thin and foldable/bendable/creaseable. It was broken at the time - cut into four segments. But the price was right - $5 - and I figured I could use some brads and a hole puncher to reassemble it back together. 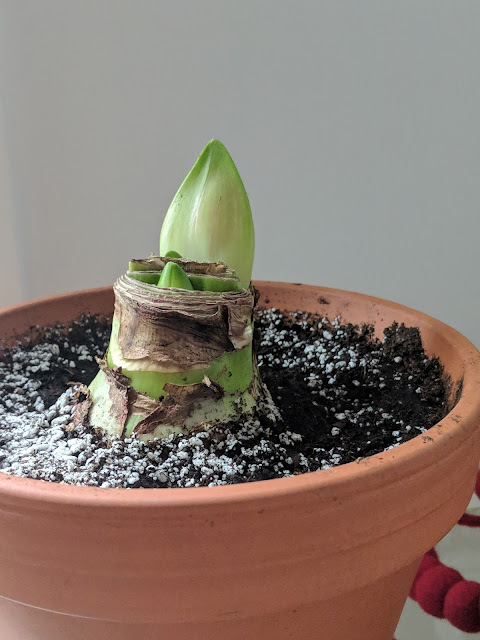 Back in November, I posted photos of the Amaryllis bulb I planted (Double Flowering Nymph) and about a week in, I shared what was then the first sign of life emerging from the bulb. 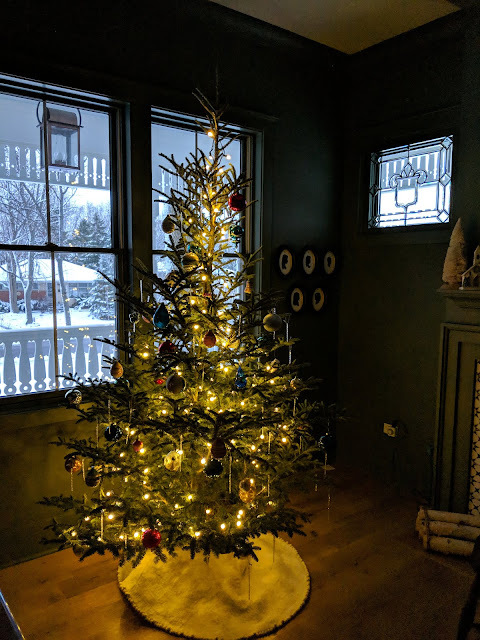 Last year, I posted a photo of our bulbs on December 16th and remarked how I was hoping it would emerge in time for Christmas. Turns out, it was *right.on.time*. This year? Different story. The photo up top shows how one of the stems has begun to emerge, but it is just that: barely emerging from the bulb. The other one - a little bit further ahead is all bud and no stem. Compare them to December 16th last year. Maybe eight inches of height difference. With nine days left before Christmas, I'm thinking this is more New Year's Amaryllis vs. Christmas flower. That's the bad. The good? It appears that we're going to get two stems with big buds on them as the second one continues to catch up with the first one. You can see a better look at both of them in the photo below. Most mornings I get into the office a little before seven am. And when I walk over to the coffee machine, I'm drawn to the East side of our building to take this in: the Winter sunset. 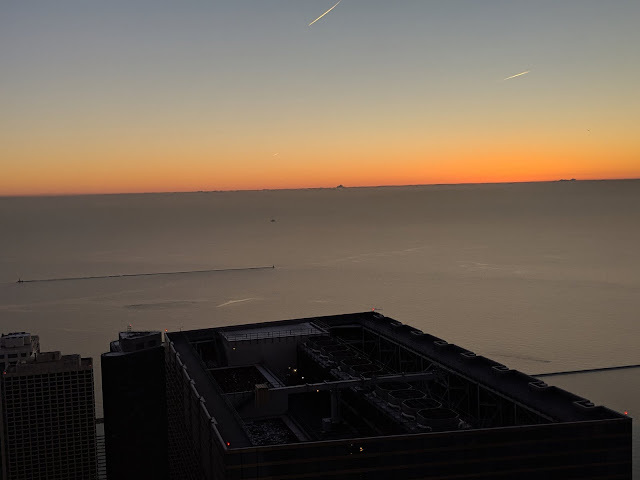 There aren't too many more mornings left in this working year, so it feels appropriate to stop and pause and reflect on the year at Edelman. Our business is not run on the calendar year, so it isn't the annual finish line, but January feels like a good time to renew our collective efforts. And December feels like a good time to look back and be grateful for what we've built. I work on a great team full of smart, strong, talented professionals. I'm grateful each time I see this sunrise that they're walking with me into battle each day. I go through Union Station everyday that I'm downtown for work, but I very rarely go through the Great Hall. 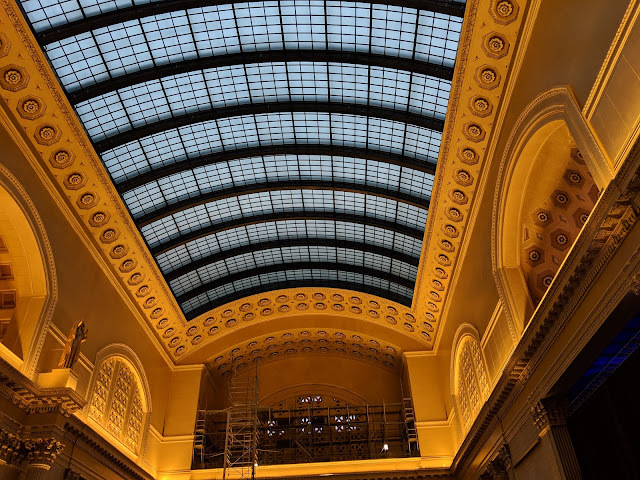 Most of Union Station is gross, but it is slowly improving - starting with the unveiling of the renovation to the Great Hall. I took this photo last week showing off the new (costly!) skylight and you can see a little bit of scaffolding in the upper reaches of the Hall. Just yesterday, I posted about with the kid's Christmas Train (the Mantleburg Line) set up in the basement, we're using more of our cars that we've picked up in the past few years while the trains were in storage. The operating barrel car that I shared yesterday was, as I noted, in a weird color gold and brown box from Lionel. In that post, I showed the components of the operating car - including the barrels, the car and just the simple tray to 'collect' the barrels once they're pushed out of the car. We run FasTrack from Lionel, so *that* setup is easy to use. Meaning...you don't need to modify any of the track/trackside in any way. The little tray just sits next to a segment of operating FasTrack and the car simply "works". Nice and easy - especially for us with the kids at the controls. 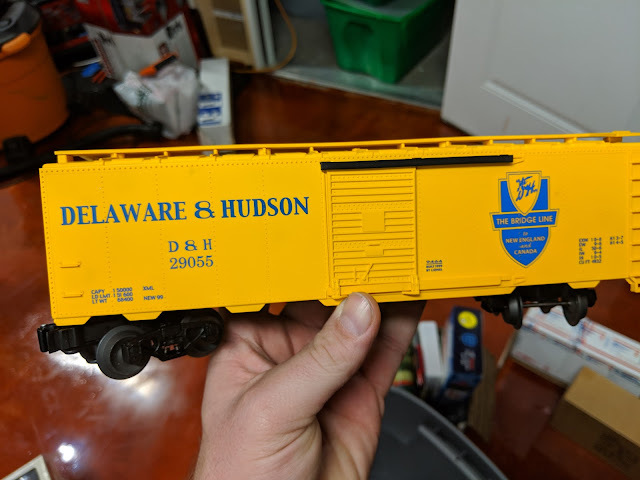 With our Christmas Train (The Mantleburg Line) set up down in the basement for the first time in a few years, I've been able to go a little deeper into the archives of Lionel O Gauge cars and accessories than before. One of the cars that I picked up over the years is this Operating Barrel Car. 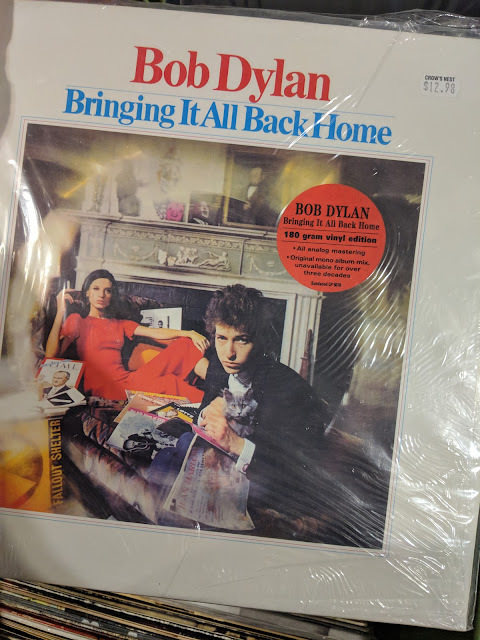 It is in this weird gold and brown Lionel box listed as "Limited Edition Series". This is the only car that is in *this* style of box. 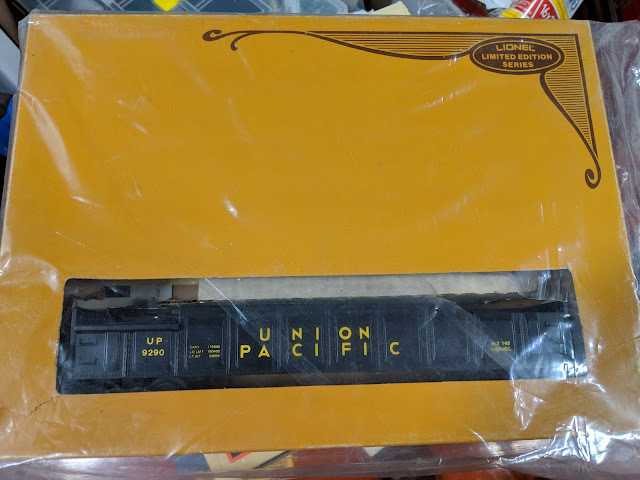 It runs on the Union Pacific line and is Lionel #6-9290. Inside the box is the car. Along with six barrels and the little tray that the barrels land in when you operate the car. In the most ideal situation, you wouldn't use that little tray, but instead have a barrel loader accessory (which we don't have!). To give you a sense for how it would work together, here's a video showing the operating car (that we have!) along with the loader. Right at the end of November, I posted a photo of a Walt Disney Comic book featuring Donald Duck on the cover that I had bought for a buck at an antique mall in Wisconsin. 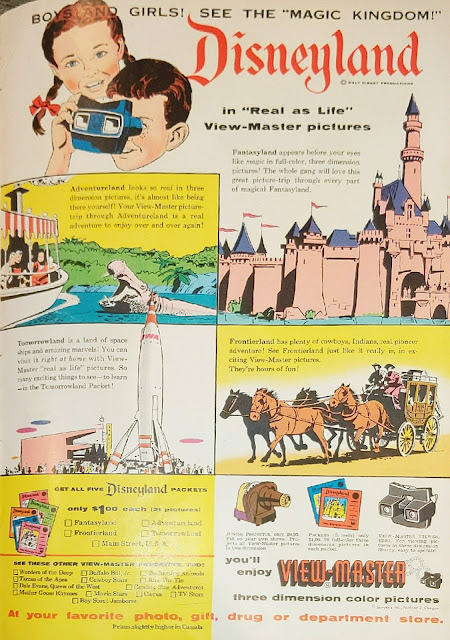 Inside the back cover of that book was this rad Disneyland View-Master ad that featured the discs from the five realms of Disneyland. Today is the third post all from that same Disney Comic book - this time another advertisement. Inside the front cover - in glossy stock - is this Kool-Aid ad. 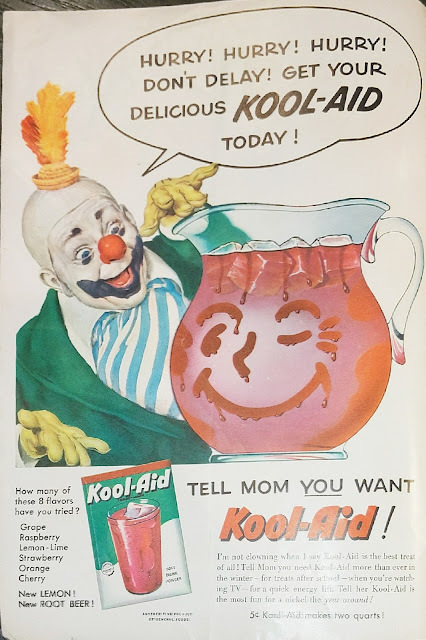 Featuring that crazy-looking clown and the "Tell Mom You Want Kool-Aid" call-to-action. It also features the value line of "5 Cents makes two quarts". A quick Google search reveals that this clown ad was commonly run over the years. I'm guessing that this clown was also probably in their tv ads? 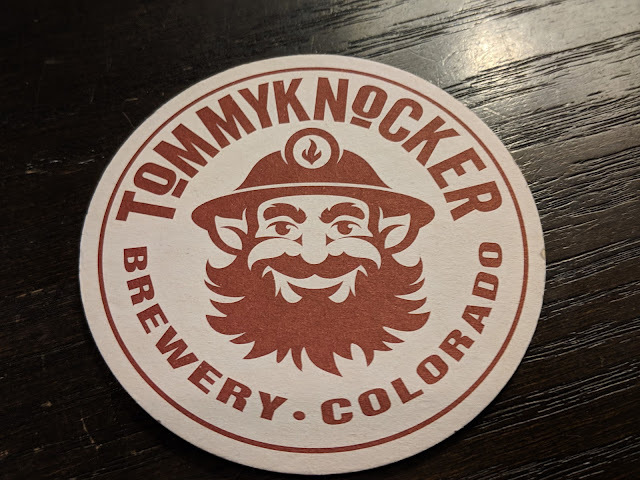 I grew up in the 80's with the Kool-Aid man running through the wall, so by then, they had retired this (frankly...scary) clown. 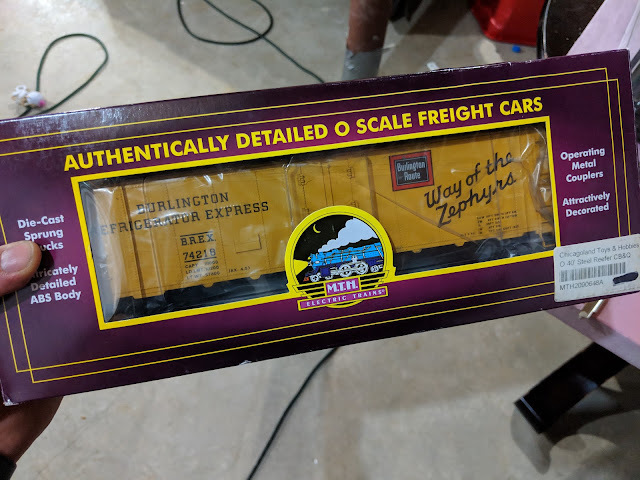 For my birthday earlier this year, I was given this MTH Burlington Line Steel-sided Reefer Car. It is marked "Way of the Zephyrs" and has the vintage "Burlington Line" rectangular logo on the side. 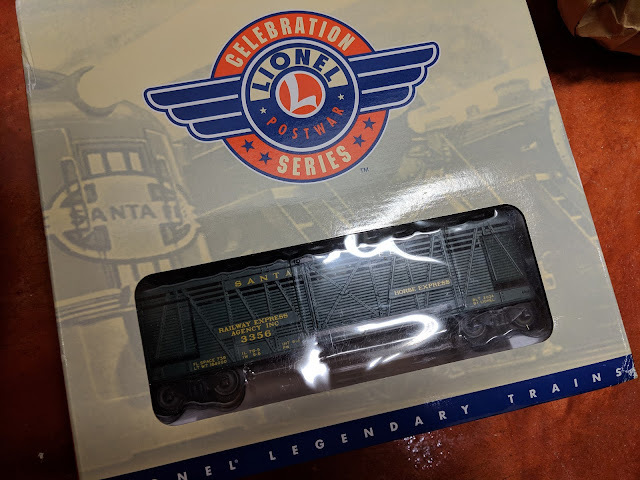 Those of you who read the blog and follow along with the Mantleburg line model train posts (ummm...there can't be *that* many of you, right???) might be confused about this box and the mention of MTH. 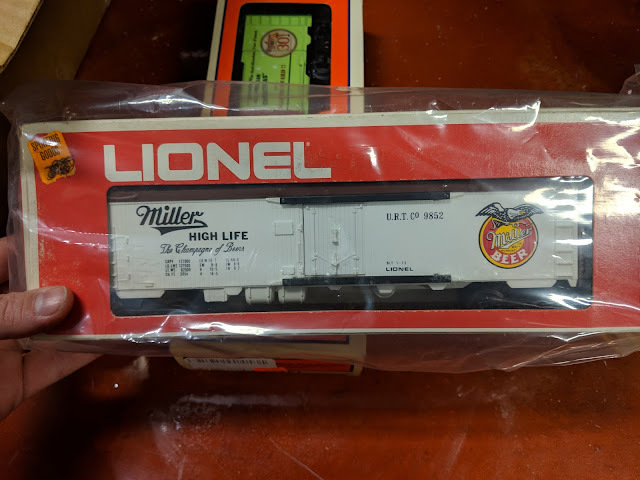 This isn't a Lionel train, but is from the competing challenger brand: Mike's Train House or MTH for short. This is the third (I think) MTH train car that we have on the Mantleburg line. The first one was a caboose and the other one is a Santa/Snowman handcar. This Burlington line car is kinda neat because everyday now I ride the BNSF line on the Metra. 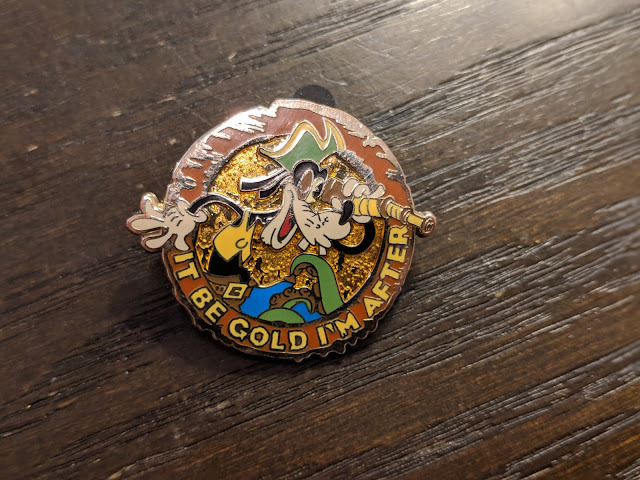 Another post about a pin that I found in my office closet is up for today. 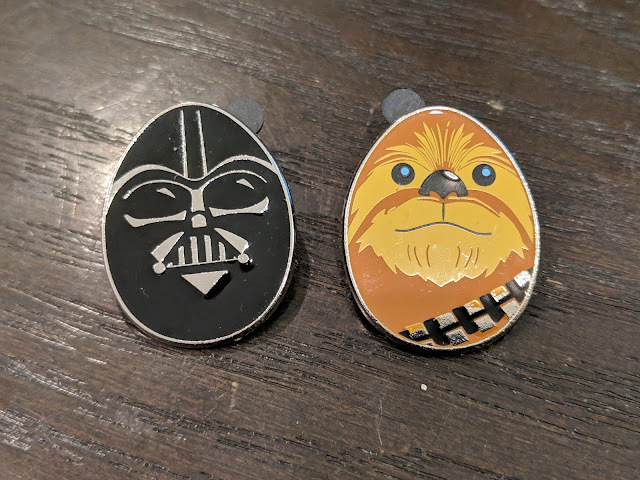 And the reason for posting this one, like the Easter Egg Star Wars ones is because this pin is part of a set that I've already posted about. 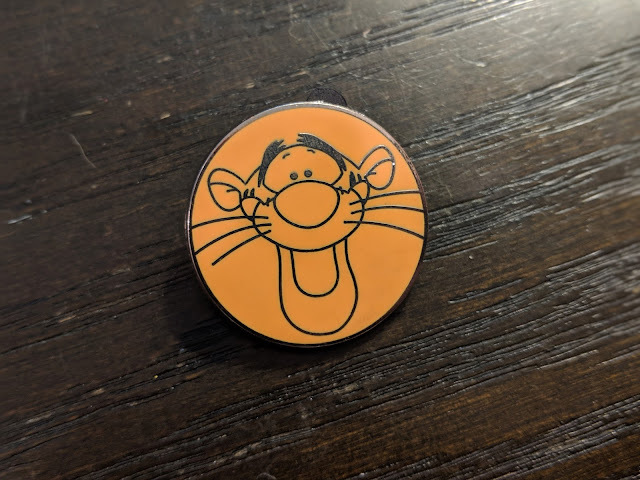 Tigger, here, on a circle is a part of the set that includes this Pooh Bear pin that I posted in April of this year. This one, was certainly, traded-for by the Bird - our Pooh Bear SuperFan.